Chipotle Mexican Grill is known for its gargantuan burritos. This year the company is refining its image and rolling out a modern store design created by Architecture Outfit founder Thaddeus Briner. 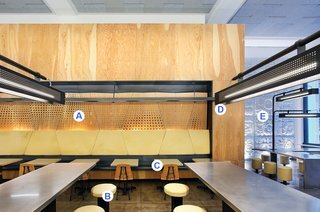 "Chipotle’s restaurants didn’t parallel the ideology of the food," he says of the old corrugated panels and exposed ductwork. Briner developed a "kit of parts": a recipe book for what the eateries will be made up of. So what can you expect with your carne asada? AC fir plywood wall panels form boxes that house banquettes, bathrooms, condiment stations, and more. High stools and family-style tables offer a moment’s repose for a quick bite on the go. Banquettes create space for longer lunchtime meals with lighting meant to mimic candlelight. LED and fluorescent lighting fixtures placed over eating areas create intimate atmospheres. Scaled-up work by longtime Chipotle collaborator Bruce Gueswel hangs near most windows to draw in guests.